Mash the beans in a large bowl and add onion, hot sauce, bell pepper, if using, cayenne pepper, egg substitute, and breadcrumbs. Mix until well combined. Press firmly to form into 4 patties. If pan-frying, heat a tablespoon or so of oil in a skillet and lightly fry until a nice outer crust forms. Or, fire up the grill and barbecue your black bean veggie burgers over medium heat. You can vary the amount of spice in the burger by using more or less hot sauce or cayenne pepper. Since the hot sauce adds a little bit of liquid, be sure to adjust the consistency accordingly. You can also experiment by adding chopped hot chilis to taste. 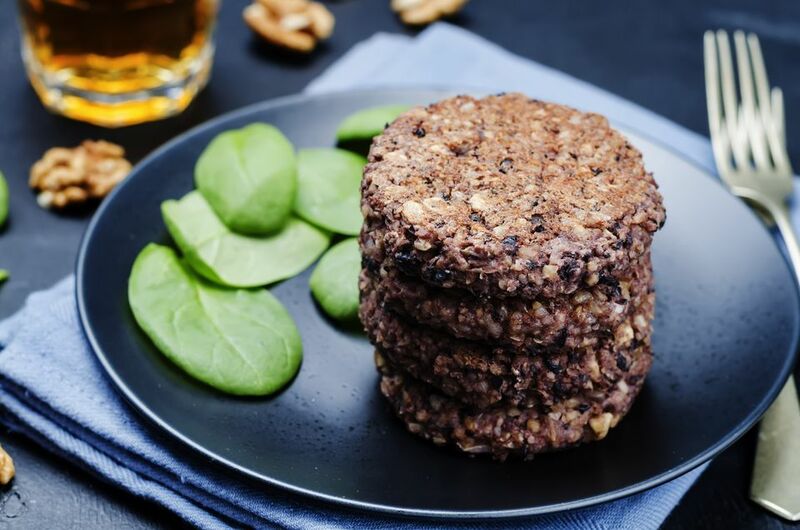 This vegan black bean patty will hold together well enough to grill since it contains an egg replacer to bind the ingredients together, making them a little bit less crumbly than other veggie burger recipes. Ener-G brand egg replacer is recommended, but Bob's Red Mill brand is another good one to try. This recipe uses canned black beans, but if you prefer, you can start with 1 2/3 cup dried beans. You'll need to soak and boil them to get them to the soft, fully-cooked consistency you'll need for this recipe so that they can be easily mashed; and of course, make sure they are well-drained, just like you would need to drain canned beans. Vegetables such as onion can exude liquid, which will make the veggie burger soggy. Before adding the diced onion to the mixture, squeeze it in a paper towel or dish towel to release the juice. If pan-frying, be sure not to overcrowd the skillet or else the burgers will steam and not produce a nice crust.